E. Short aka the Black Dahlia's severed remains were put "on display" on Degnan Blvd, Degnan Blvd becomes Norton Ave, many people have said that they think the killer still thought he was on Degnan Blvd. E. Short was obsessed with the Chicago Lipstick murders and the murder/dismemberment of 6 year old Suzanne Degnan, in her last letter she stated that she was going to Chicago to do some modeling with "Jack". That's great! Thanks for the information. Praxis, why certainly! I'm glad someone supports my efforts. I'll clean up my notes on this case and post them soon. So how much fallout or negative opposition has Dennis received for including the Black Dahlia murder as the work of JT? Oh, it's too much for anyone to believe, oh it's too much! You can't link every serial murder in the country to just this one guy! Where have we heard that before, over and over again?! Photo enhancement alone isn't enough information to be certain that the photo is actually of Elizabeth Short, certainly though, it is incriminating and suspicious when coupled with other macabre photos found in amongst JT's personal property, it does say something about the mindset of JT. The main problem for those opposed to including this crime, is; that people can claim that only Dennis has had possession of it, much the same way it is with the hood he says he found in the amplifier case. This is why I work the evidence via documentation, documentation that has already been placed in the public domain so that a "chain of custody" isn't the overriding issue. For anyone that doesn't have limited powers of observation, the Ramsey ransom letter has an overwhelming number of JT's nuance clues integrated into the thing, there are at least 23ea formed by over-under intersection and proximity, these only occur because of the way the author deliberately spaced the words. If in it we had only 2ea or 3ea, it would all be a stretch, but there are at least 23ea! Many, many secondary JT nuance clues are lased throughout that document, in the word "Victory", the letters "c" and "t" are artistically constructed to form a JT nuance very similar to the way hell-hole on the Zodiac era "Red Phantom: letter has the JT nuance. Go look! 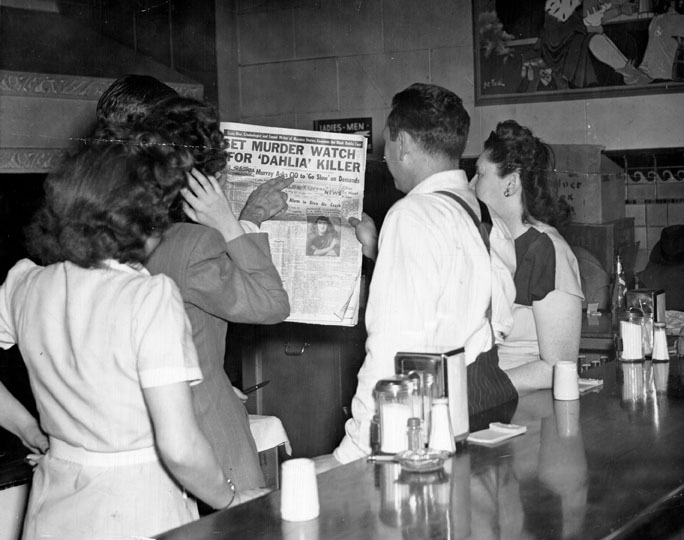 By establishing a solid link between the Ramsey murder and the California Zodiac killer; the much fewer JT nuance clues become more valid in other crimes like the Black Dahlia, Chicago lipstick, Tex-arcana, I45 etc. I think that a solid link from the Zodiac killer crimes to the 1976/77 OCCK case is made via the recently released FBI Zodiac, 1968, typewritten, "Dear Draftboard" letter and nuances compared to the "Allen letter to Dr Danto" in the OCCK case. Perhaps something spooked JT before he could send in a bunch taunting letters in that crime spree?, perhaps much the same way he damn near got caught in Paul Stine's murder, a crime in which the killer should have been detained as a material witness?! Perhaps LE has been compromised, ya think? Another signature item that links these crimes is that all of them had a "time/date" stamp put on the documents, the four line address box and the cryptic sign off acronyms are also signature elements in these crimes. "Order out of chaos" as former FBI profile John Douglas puts it. The killer knows he's involved in a chaotic scene and to cope with that aspect, he does "organized" things to be able to "cope" with an act that he knows "deep down" is very wrong. Speaking of a time/date stamp, a 17 jewel Croton "military" watch was found at the Black Dahlia murder site. I'm still trying to find out what the time on the watch read. 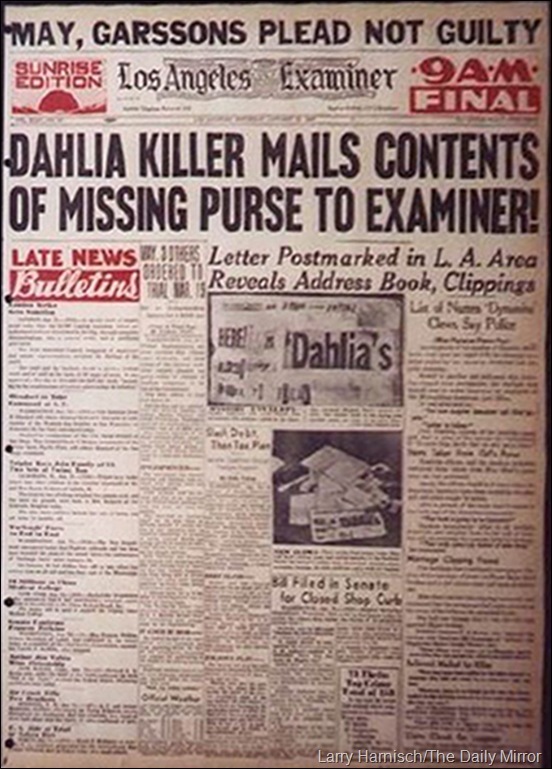 Back then, Capt Donahoe of the LAPD said that the Black Dahlia and Chicago Lipstick were "likely connected" because of similarities in the ransom note to the taunting letters sent in during the Dahlia era, also they noted the fact that E.Shorts remains were placed "on display" near "Degnan" ave. It's also well documented that E.Short was being stalked and living in fear for her life. Her murder stands as an early example of "things are not what they seem", this is almost an exact Zodiac killer threat/quote and almost identical to what John Mark Karr first said when he was picked up in the JonBenet Ramsey murder case. In other words the killer wanted the cops and public to think the victim was done in by a sexual deviate fiend, when the motive was otherwise. 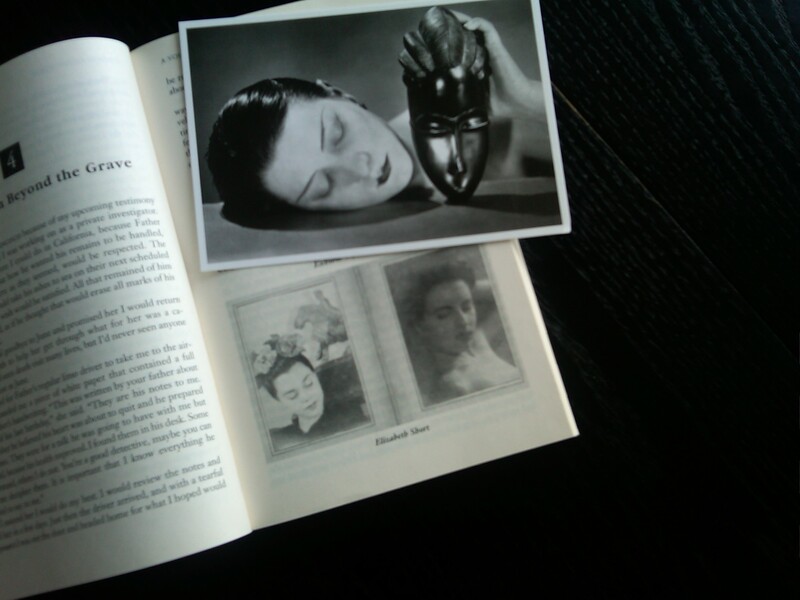 The Black Dahlia case is ripe with JT clues. Everything about the case is what I like to refer to as Zodiac Jack 101. Compare to the Black Dahlia documents and one will see they are written by the same person. Early newspaper with 'Jack' clues. This is a "smoking gun" document that links JT to the Ramsey murder case as well as BD, Zodiac and Chicago Lipstick murders. All of these cases share several identical characteristics in addition to the matching of JT's handwriting. This is my attempt to show what JonBenet Ramsey's body pose would have looked like with the black gaffers tape covering her mouth. Tape that was never found on the crime scene and was said to have been cut from the roll, not torn. I'm not saying that the tape was shaped like a smile because I don't know for sure. I believe that her body was posed as a mimic of the Black Dahlia corpse. Evidence showed that the tape was applied after she was already dead. That heart shaped drawing on the hand is not accurate and totally misrepresents the evidence. A tiny red outline shaped heart was on her hand on the upper portion of a backwards stemmed J along with a Zodiac killer cross-hairs on the small hooked end. I believe that the J represents the shape of an arm and the heart is on the upper arm with the cross-hairs where the hand would be. Get it? I was told that Tarrance had a small red outline shaped heart tattoo on his upper arm. Black gaffers tape is more narrow than regular silver duct tape. Former detective Steve Hodel links BD and Zodiac, with which I do agree. I don't believe that his father was involved. I do think that Dr George Hodel was being groomed as a patsy. Here's where Steve Hodel loses credibility, there's no way that these are images of E. Short, her family has said the thing. For a long time I was pretty fed up with Hodel, then I gave him another look. Two key points, 1) these are not of E.Short 2) his father was being set up as a patsy. Here's a image of the headlines of that era. Notice the inference to "Set Murder Watch". All of the crimes that I believe to be linked have a "time" element or theme. The same of which is Zodiac Jack 101. He liked to add a time/date stamp on all of his murders. Check out the Brian Hartnell car door from the Zodiac killer era. 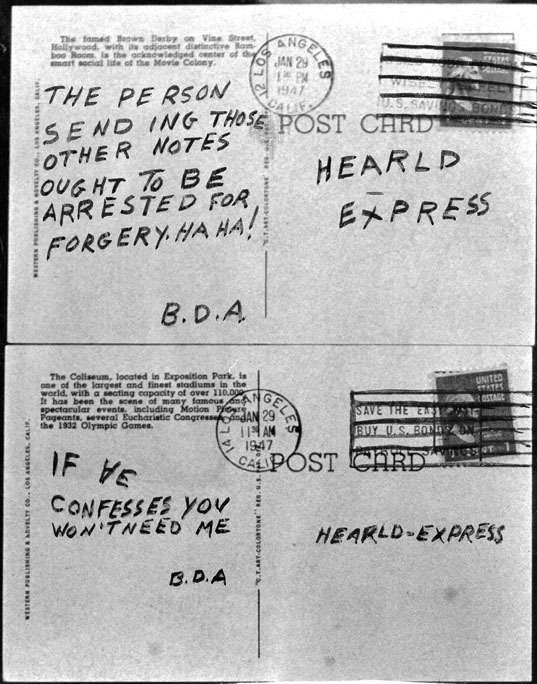 This is a Black Dahlia crime document. In every way it compares to the Zodiac killer documents. Notice for instance the spacing he puts in the word 'sending'. 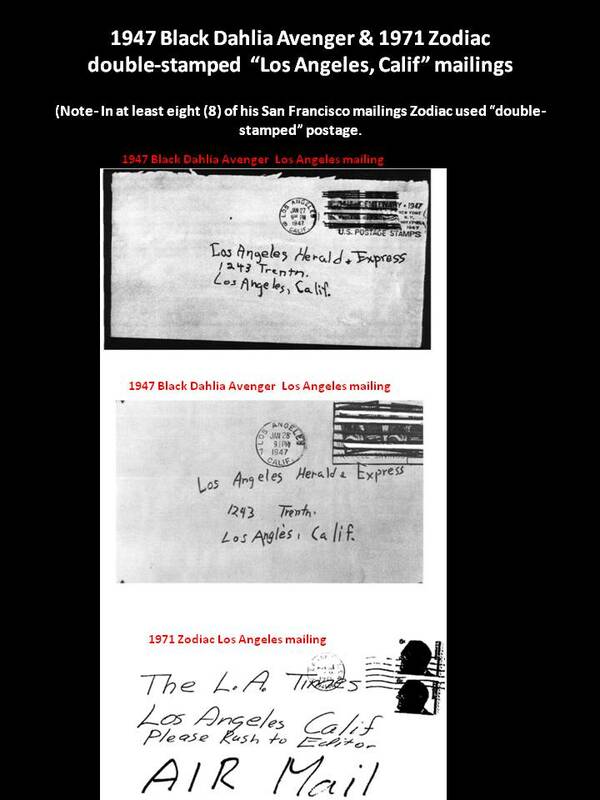 During the BD era, he did use double postage on some things as he did during the Zodiac killer era. It's exactly the same taunting crap. Notice the structural modification to the implied word 'HE', the 'H' appears to be an inverted 'A'. Sending her things into the Examiner is Zodiac Jack 101. Going back to the newspaper article in the BD case about the suspect having a JW tattoo on his arm and missing a finger was probably an attempt to plant false information about the killer. If the cops picked up on Tarrance and found the JW tattoo and that he had all of his fingers, that might exclude him as a suspect? In any event, it's a very peculiar aspect of the BD case. The fact that one suspect was said to have had a JW tattoo is an eye opener. A lot of sailors had tattoos, how many had a JW tattoo?, damn few I'd say. Here's the Brian Hartnell car door from the Zodiac killer era. Notice the dates, near Christmas and the 4th of July. Notice all of the nuances, like the forward leg of the letter k in knife. Here's my preliminary attempt at a "structural" analysis of the 'gasoline soaked' envelope from the BD case. Notice these particular nuances: 1)The tips of the pasted words; 'HERE! is 'Dahlia's, this was a deliberate piece of artistry, kind of like many of his printed letters had a hook or point to them. 2) He had a history if making his "ing" cursive and shifted and/or spaced 3) The size of the letters NOOW as if to say the word no...... dramatically with emphasis on the W, like in a horror movie line. 3) this leaves a smaller 'FLLO (his mother) as an additional clue. 4) He had a history of choosing several different types of capital "R's, the lower left R has the prominent front foot on it as did the R in Ramsey, on the phoney ransom note. 5) the double postage which re-occurs throughout his murderous career. There probably are other nuances that I've missed. BTW, it's my view that the way he structured the R on the Ramsey ransom note, served also as a JT structured initial clue. The top of the R is the J, the bottom is the T. Go look!